Today there is much more literatur available than ever before. And the internet has increased dramatically the access to more books. 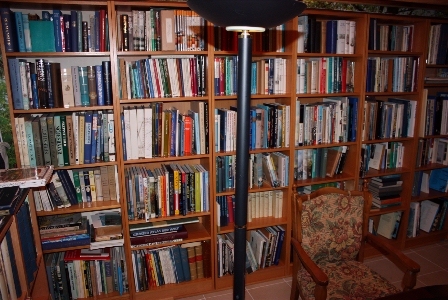 I "inherited" the major part of my maritime library - that is about 80%! - from the huge collection of the Swedish collector and draftsman Sven Petterson, who passed away around 2002; unfortunately I never got to know him personally... and neither do I have any more data about him, not even how he looked like. After his death, his family sold the entire book collection to a local second hand book dealer in Växjö, where I found it...and eventually I bought his entire library and integrated it with mine. As it became clear from the books and the notes he left behind, Sven had collected his library of over 800 volumes since 1970 at least, from all over the world, in many languages. He had close relations to Stockholm´s Sjöfartshistoriska Museet and lived in Malmö, South Sweden. So I dedicate these pages to him, as a "brother" of mind. I only introduce some titles here, as a suggestion to readers, but this is no sale! Although this page is in English and I am living in Sweden, my native language is German, as most of my books. But You can find many books in English, Swedish and other languages as well. H.M.S.Victory - Building, Restoration and Repair Bugler, Arthur University Printing House, Cambridge 1966 17Pl. Vi sejlede bare – virkligheden bag Vi, de drunknede Jensen, C & Hermansen, K. Marstal Søfartsmuseum 2009 208+CD!